Over the course of the first year of the Weekly Leader podcast, we’ve had the great fortune to learn about leadership from some men and women who bravely serve our country. However, unless you live on the water or make your living from it, the United States Coast Guard is probably the least know branch of the US military. Part of the confusion may be caused by the fact that even though their emails are on a .mil domain, they are are actually part of the Department of Homeland Security. Regular Weekly Leader readers and podcast listeners will know that I have a maritime background and know a lot of people in the US Coast and am proud to call many of them my friends. These connections have given us great access to leaders throughout the service and all the way up to the top, Admiral Thad Allen, Commandant and one of our Weekly Leaders. In a number of podcast episodes, Pam has stated how impressed she’s been with US Coast Guard personnel that she’s met over the years at various leadership conferences and events. Listen to the below podcasts and I think you’ll agree. A further benefit of these strong relationships has been getting an inside glimpse at how a government agency advocates and uses social media, a favorite Weekly Leader topic. Finally, one of Weekly Leader’s most popular contributors is Mario Vittone, a 2009 recipient of the United States Coast Guard’s Alex Haley Award which“recognizes special achievements of individual authors and photographers for whose published works have excelled in supporting Coast Guard operations through skillful public communications.” Mario received the award based on four extraordinary articles, three of which were published on Weekly Leader. A Little Perspective and Ready in Our Hearts. Millions of Readers Digest readers had the chance to read How to Make an Impression which was a version of his very popular (better) Weekly Leader post titled A Letter on Their Hearts. (editor’s comment). The Truth About Cold Water was published on the popular maritime website, gCaptain.com. On several occasions Mario has filled in as a podcast co-host or panelist and his thought provoking closing keynote at the 2009 USCG Human Performance Technology Workshop in Williamsburg, VA has been Weekly Leader’s sole videocast to date. There’s a lot to learn about leadership from the sea and listening to these podcasts is a great way to start. This post is part of a series celebrating one year of Weekly Leader podcasts. 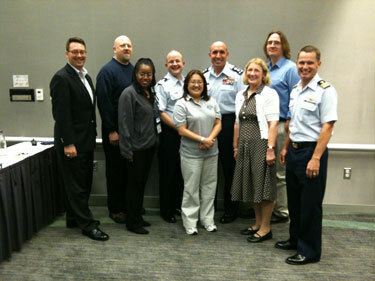 Tagged with Admiral Thad Allen, Charlie Coiro, Mario Vittone, PodCamp, US Coast Guard.